What a day this was. A soggy, moist day. After driving all the way from Nanaimo, BC, I finally made it to the road of doom to the Crystal Mill. Despite having good AWD and winter tyres, I chickened out about 2 miles in to the road from hell. I reluctantly ditched the Rolls Royce and hiked the rest of the way in during a thunder and lightening storm. None too wise to be hiking through a lightening storm carrying 3 tripods. During the worst of it I decided to stash the tripods and find shelter. After a lengthy chocolate break I got back on the trail and finally made it to the Crystal Mill. What a sight to behold! This is the kind of thing I live for. 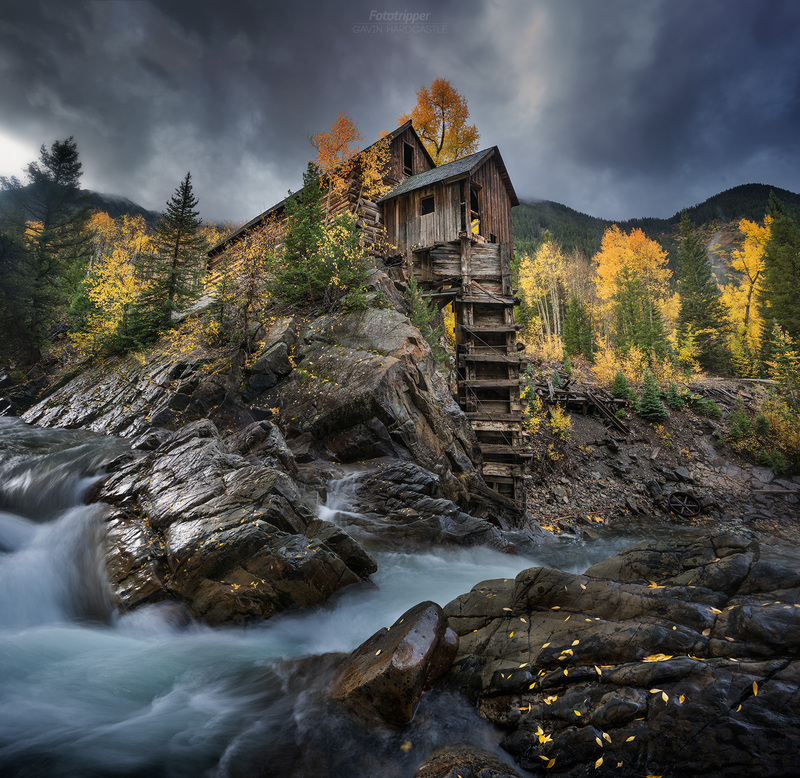 Foreboding skies, vibrant fall colours with a derelict mill next to a waterfall. What more can the landscape photography ask for? After an altercation with a surly tourist who appeared to be afflicted with a chronic case of ‘Entitlement’, I got to work capturing as many shots as I could while shivering in my soaked state. I got picked up by a nice Vietnamese family who were touring through the US which saved me from a miserable hike back to the salvation of my warm vehicle. There was a bit of suffering that day and quite a lot of risk but I feel it was totally worth it when I look at this image. Love this pic Gavin! What aperture and ISO was this at? Assume you used an ND filter as well? How long did you expose? You are a true artist!